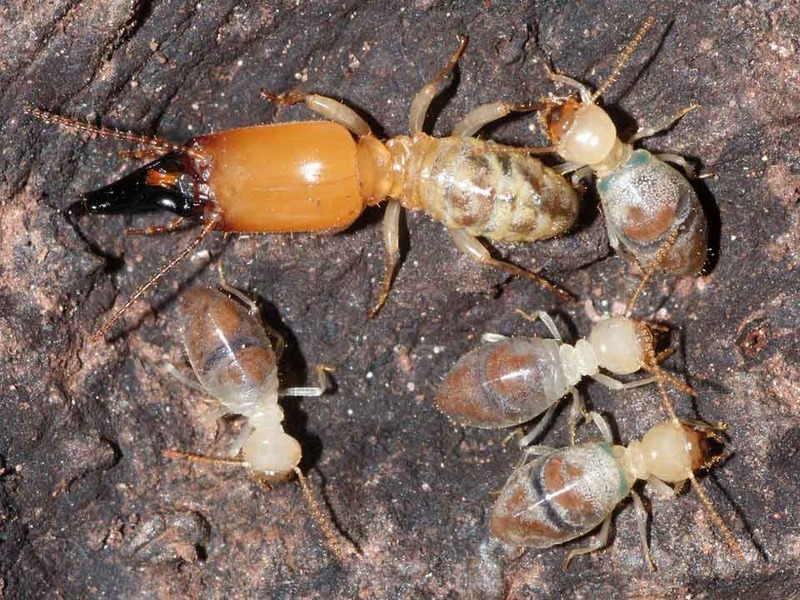 Future Genomics: Aged termites carry out suicide missions on behalf of their nest mates. Aged termites carry out suicide missions on behalf of their nest mates. Biologists led by biochemist Robert Hanus of the Academy of Sciences of the Czech Republic in Prague found something strange with termites in a forest in French Guiana. The strange thing is presence of unique spots of blue on the backs of the insects in one nest [see figure below]. When touched with forceps the termites having these spots exploded. Further study of these blue spots showed that they contain explosive crystals. These spots (crystals) were found only on the backs of the oldest termites in the colony. Their study concluded that the aged termites carry out suicide missions on behalf of their nest mates. After their initial observation, the team carried out field studies of Neocapritermes taracua termites and discovered that those with the blue spots also exploded during encounters with other species of termites or larger predators. The researchers report online today in Science that the secretions released during the explosion killed or paralyzed opponents from a competing termite species. However, if the scientists removed the blue crystal from the termites, their secretions were no longer toxic. These blue termites always had shorter, worn-down mandibles than others from the same species, indicating that they were older. Analysis of the crystals showed that they contained a novel protein that is unusually rich with copper, suggesting that it's an oxygen binding-protein. Rather than being toxic itself, it likely is an enzyme that converts a nontoxic protein into something toxic. It has been suggested that s when the termites explode, the contents of the back pouch actually interact with secretions from the salivary gland and the mixture becomes toxic. It's the first time two interacting chemicals have been shown responsible for a defense mechanism in termites.